Brief Notes about Central north in general and Ogongo 1 and 2 Observatories in particular, Northern Namibia. Central-northern Namibia is home to an approximate 43% of the country's population, according to the National Population and Housing Census of 2001. A large number of these people still depend directly on natural resources for their livelihoods and have adopted agro-silvi-pastoralism as the main land use. 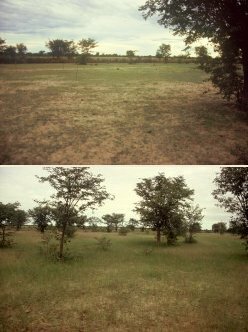 Following the Giess (1971) classification of vegetation units, the study area belongs to the Mopane savanna an extensive vegetation type within the savannas of southern Africa. This vegetation type is found in the north-western part of the country and is characterized by a well-known economically and ecologically important tree species Colophospermum mopane, the mopane shrub/tree (du Plessis 2001). The grass layer is usually better developed by Fingerhuthia africana and Enneapogon scoparius (Mr. Strohbach1, pers. comm. 2007). The study site also falls within the extensive Cuvelai Drainage Basin, which comprises a complex network of interconnected shallow watercourses locally known as oshanas (Mendelsohn et al. 2000), hence occurs as an open tree savanna found on interfaces of slightly elevated sand dunes between the seasonally flooded oshanas (du Plessis 2001). The Ogongo2 observatory is situated on the communal farming areas in the Omano Go Ndjamba village which is an estimated 10 kms west of the college on similar latitudinal location to Ogongo 1 observatory. The land use system in this village as in most parts of central-northern Namibia is agro-silvi-pastoralism, based primarily on pearl millet Pennisetum typhoides as the cropping component (locally known as Mahangu), livestock keeping through communal grazing, and a multipurpose use of indigenous plants e.g. wood harvesting. Although this conventional way of life has, for many decades protected the environment within which they live, the system is said to be currently under stress mainly due to population increase (Kreike, 1995). As a result, major natural resources are depleting at an alarming rate, hence a need to re- evaluate and improve our knowledge of natural resource management. The two observatories, which where established in 2006, depict two contrasting land uses, with Ogongo Farm being a protected area where rotational grazing, animal supplementation & vaccination as well as other modern farm management strategies are applied; and the communal land farming areas in the village of Omano go Ndjamba where traditional farming strategies are more at play, hence fitting in well within the BIOTA research framework.